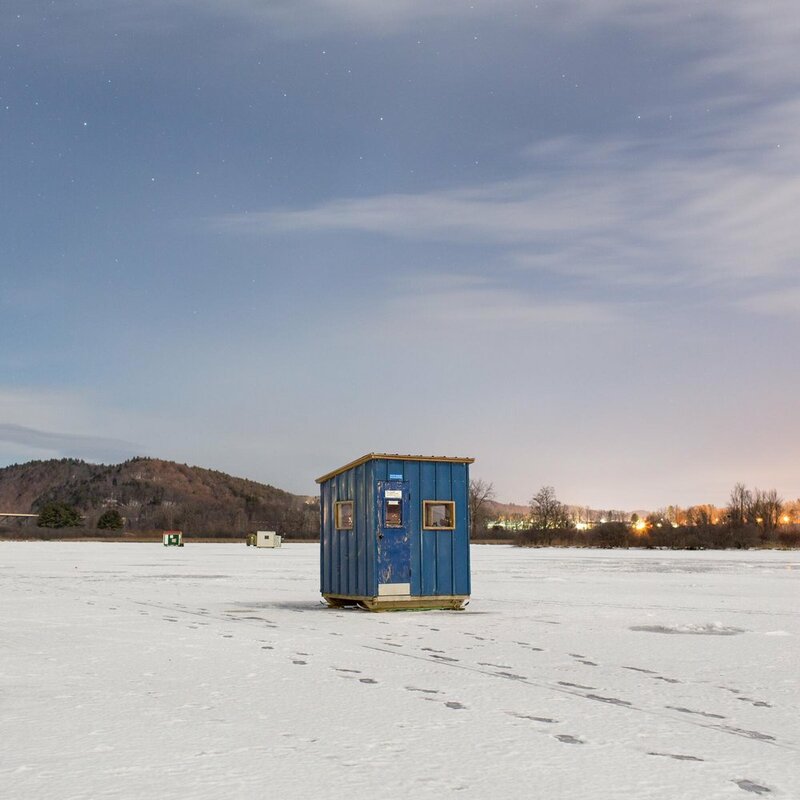 Ice Shanties is an exhibition featuring the structures, people and culture of ice fishing seen through the lens of Vermont-based Colombian photographer Federico Pardo. Pardo’s large-format color photographs of ice shanties at “The Meadows” in Brattleboro, Vermont, are paired with audio reflections from the shanty owners drawn from interviews conducted by the Vermont Folklife Center. While Pardo’s shanty portraits provide a visual entrée into the material culture of ice fishing, the shanty owner interviews are an opportunity to engage with the human side—the personal, familial, and recreational culture—of ice fishing. These simple yet intriguing structures captured the attention of Columbian-born photographer and part-time Vermont resident Federico Pardo, who in 2016 began documenting the shanties on a frozen floodplain of the West River in Brattleboro, Vermont. Smaller portraits of fish species and ice fishing equipment will be presented along with audio explanations of fishing techniques. Pardo’s photographs are an atmospheric yet detailed survey of the structures and the stark landscape from which they spring. He is an outside observer drawn to the cold beauty of this world of ice and the suggestive human presence residing tentatively on its surface. His photographs tempt us to imagine otherworldly narratives about the shanties, their owners and the seemingly timeless space they inhabit. “The dreamlike, speculative narratives suggested by Pardo’s images are drawn down to earth by the voices of the shanty owners themselves—many of whom agreed to be interviewed for this exhibition,” explains Ned Castle, Vision & Voice Gallery Director. Shanty #7, Owned by Roy Gangloff and family. In these conversations the fishers speak of their shanties as structures, remark on the amenities and people they house, detail the practice of ice fishing, and, directly and indirectly, reflect the relationships, connections and community they reinvent each year at the Meadows. Together, the images and voices give us a chance to connect with the material and human cultures of these ice fishing enclaves. OPENING RECEPTION: February 15, 2019 from 5:00-7:00 PM, the Vermont Folklife Center in Middlebury, VT will host a public reception and gallery talk with photographer, Federico Pardo. Complimentary locally sourced food and drink, including beer, wine, craft cheeses, produce and more will be served. This exhibit is made possible with support from the Vermont Folklife Center Vision & Voice Gallery underwriters including: the Rotary Club of Middlebury, VT; Cabot Creamery; the Vermont Community Foundation; the Vermont Arts Council; and by the Center’s many generous supporters across the state. The Vision & Voice Gallery is free and open to the public Monday through Friday 10:00 AM to 5:00 PM. The Gallery is ADA accessible on the first floor (rear entrance) of the Folklife Center headquarters at 88 Main Street in Middlebury. The Vermont Folklife Center’s mission is to broaden, strengthen, and deepen our understanding of Vermont; to assure a repository for our collective cultural memory; and to strengthen communities by building connections among the diverse peoples of Vermont.